Join us this Saturday the 13th April for our popular Yamaha MT test day. We would like to wish our customers, past and present a very Happy Christmas and a great new year, and thank you for your most valued custom. We will be closing at 5.30 on Saturday 22nd December, and reopening on Saturday 29th December. For new year we are closed as normal on the Sunday and Monday, plus new years day, returning to normal opening 8.30 am on the Wednesday 2nd January 2019- See you all then. 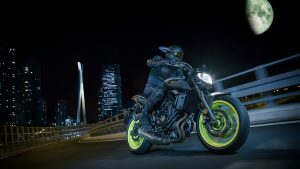 The Yamaha Niken is an all new concept, like no other that has gone before . Join us on Saturday 9th for the Yamaha 2018 Sport Touring Demo day here at Flitwick Motorcycles..
Ring now to reserve your test- ride* ask for Saul David or Carole. 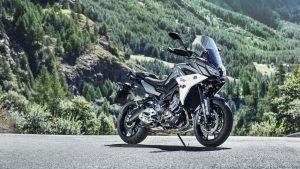 The all new Yamaha Tracer 900 GT will be arriving in our showrooms soon, and we are delighted to say our Demonstrator will be arriving imminently. To book your test ride* give Saul, David or Carole a ring to arrange. 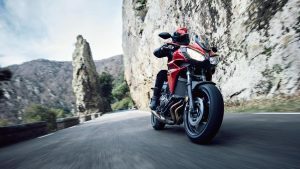 The best-selling Tracer 900 has undergone a complete redesign, with refined new bodywork and improved ergonomics making it an even more attractive and capable Sport Tourer. 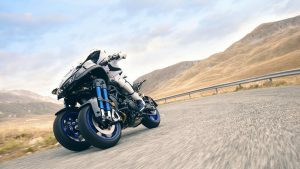 To offer even more, Yamaha have also created a premium version of this remarkably versatile motorcycle that’s designed for riders who want a high specification as standard. Equipped with colour matched hard luggage, fully adjustable suspension and heated grips, the Tracer 900GT.. and it is is ready to take you anywhere. 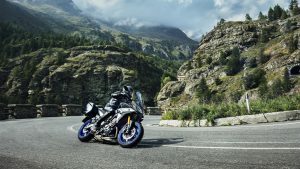 For a limited period only, Yamaha are giving away a FREE Touring Pack worth £1,208* with all new Tracer 700 models. *Specifications and appearance of Yamaha products as shown here are subject to change without notice and may vary according to requirements and conditions. Offer available on all new Tracer 700 models that are DVLA registered between 26/03/18 and 30/04/2018. No cash alternative. For a limited time only, get a free Sports pack when you buy a new Yamaha MT-09A. Call in or give Saul, David or Carole a ring. At last the Weather is showing signs of improvement, and our minds turn to getting out on the roads again.For those of yo u who are considering buying your big first bike, or changing up, remember that we have a fleet of demonstrator machines so you can try before you buy. You must have a full Motorcycle Licence, with only minor convictions and no accidents or claims within the last three years, but please ring us for the full criteria. We have just added the MT-03, MT-07, MT-09 and MT-10 to our demo fleet, and with low rate finance deals and free Accessory packs on many of the Yamaha range there’s never been a better time to buy. Give Saul, David or Carole a ring to discuss. After many days of planning, the much awaited Flitwick Motorcycles MT test day dawned with the weather decidedly cold and wet. Despite this we had a great turnout, with an early queue to book a test ride on one of the fabulous Yamaha MT range. 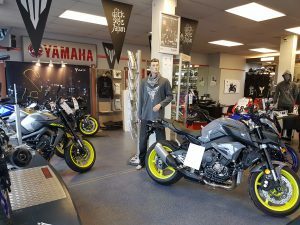 The Japanese buffet was well received, with very little left at the end of the day, and most took part in the competitions to win gear, a £25.00 jar of Easter eggs, and the big one the Yamaha competition to win an awesome new Yamaha MT 09-SP. We were pleased to see that many took advantage of the Complimentary Temporary Tattoo facility, with the children having some awesome face painting in the hand of the very talented Pierangelo, who also took the souvenir photos for you to take away, some of which you will see here.